Solve this IQ Birth Date Puzzle. Share it with you friends. A year Ago on his birthday, he had five candles and he lit all except the last one. Today he is going to light all the candles. 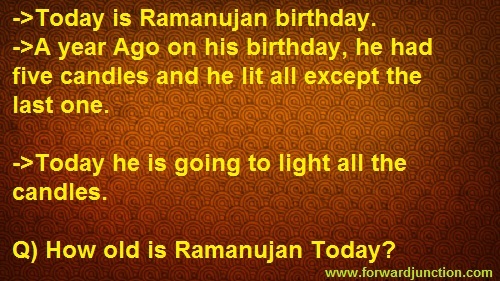 How old is Ramanujan Today? Note: He is not turning five today. The Candles represent binary number. So a year ago Ramanujan had lit 4 candles except 1. This year he lits all 5 candles. So Ramanujan's age is 11111 = 31. In Forward Junction we post the puzzles, riddles and quizzes that are viral on social medias. The pages in this website help you to solve those puzzles. You can reshare it in other groups and challenge your friends. You can search for the required puzzle or keyword to check and get the answer for that. Is it 30/31 or 40/41?